Sam Ollinger - photo: Joe Linton/Streetsblog L.A.
Sam Ollinger is the Executive Director of the nonprofit bicycle advocacy organization BikeSD. The national Alliance for Biking and Walking named BikeSD the advocacy organization of the year in 2014, and nominated Ollinger for individual advocate of the year. She was recently named one of the the San Diego Daily Transcript’s top 40 San Diego leaders under 40. The interview took place in person earlier this month in the San Diego neighborhood of North Park. Streetsblog: Tell our readers about your background. Where did you grow up? What did you study? How did you get involved in bike advocacy? Sam Ollinger: The short story is that I was born in India. I moved to the U.S.—to the East Coast—when I was 16. I graduated high school in the U.S., went to college in Philadelphia. I was there for about a decade, then I moved out to San Diego, primarily because my husband wanted to surf. My educational background is in accounting. I have a Bachelor’s in Business Administration. Back in Philly, I would say I was more of a weekend [bike] rider. Most of the time I took transit or walked everywhere. My entire world was within two miles. My husband was really into biking and he got me into it, doing thirty-mile trips. There’s a really beautiful bike path called Kelly Drive, along the Schuylkill River in Philly. We used to ride there almost every weekend. I essentially did it just to humor him. I wasn’t particularly enthused about it. I was a practical rider. If I had to get groceries, and the bike was the most efficient way, I would do it. Like a lot of people, I didn’t necessarily consider myself a cyclist. In bike clubs or riding there [were] a lot of terms I didn’t understand, like, “AB riders.” I still don’t get it, to be honest. I really had no interest in any of that. I wanted to support the Philly bike coalition at the time, but I didn’t understand what they did. I don’t remember seeing any bike lanes in Philly when I was living there, except for the bike path we used to ride on, along the river—I didn’t understand the connection between civic engagement and changing policy, none of that stuff. When I moved to San Diego, I honestly didn’t know anything about Southern California. I was shocked that people didn’t ride here. It was sunny all year round, and I wanted to be outside all the time. For the first two to three years, it’s all I did. I’d go outside and ride. Every day. Weekends. I rode to a point where I got exhausted three years later and needed to take a break. There was just no bad weather, so I never had a break. During the course of those three years, I was trying to figure out why there were no bike lanes. There seemed to be very little accommodation. Any time I read about cycling in the news it was always very derogatory: someone had a DUI and that’s why they were riding, or a homeless guy got killed by a trolley. It was always a very negative connotation associated with bicycling. There was a bike shop in town called Velo Cult, that has since moved to Portland. I stumbled across a website that the owner had created called SDbikecommuter.com that had an online forum for local cyclists, essentially for your everyday rider. I started participating in that forum around 2008-9. The shop created these casual bike rides on Sundays that would end at coffee shops, farmers markets, so forth. I started making friends, meeting almost everyone who rode a bike in the urban core of San Diego. One of the things that came up during discussion on those rides was that there were no blogs about cycling in San Diego. I was like, “Well, I’ll write one. It’s not hard.” So I just created a personal blog. I called it “Brown Girl in the Lane.” I thought it was funny. It was a play on a song I really liked by Boney M [Brown Girl in the Ring]. I started to get some readership. Two friends—basically the only other bike bloggers in town that I knew at the time—asked, “Why don’t the three of us create a blog that all three of us could contribute to?” Our aim would be trying to change the rhetoric and the narrative of how cycling is perceived in San Diego. At the time I used to read Bike Portland a lot, as well as Streetsblog. So we wanted to create something that would merge the two styles together. Will’s a very poetic writer, so he would write about the sunrises he sees riding into work. Thom was a historian so he would talk about the media narrative and how they write about bicycling and transportation. For me, with my financial background, I was looking at how much the city is spending on bike infrastructure—not very much at all—but they had fancy PR to say that they’re doing all this great stuff. We started BikeSD.org as a blog in August of 2009. We let people assume we were an organization. We didn’t really correct that misperception. Our readers started to take us seriously after a while. I remember people would email and say, “Hey—I got in trouble with the cops. I got a ticket.” I would take lunch break and go with them to the police station and advocate on their behalf. For some reason—and this is sort of the benefit of San Diego, I don’t think it would work anywhere else—even though we’re a large city, we behave like a small town in some ways. There’s no other city where a police chief would meet with a random blogger, take them seriously and then change the entire training paradigm for how they address cycling issues. That’s essentially what happened. That dialogue with the SDPD chief gave us a little bit of credibility in the city, and within the bike community. Eventually, I wound up going to one of CalBike’s summits in L.A., where I got to meet all the bike advocacy bigwigs—your Chris Morfas, and Dave Snyder. I remember Dave in particular because he was the E.D. of Calbike. I found the advocacy work very interesting and very invigorating in a way. There were all these really passionate people. They got my perspective. There was that sense of camaraderie. Around that time, I started volunteering with our local San Diego County Bike Coalition, as well as with CalBike. I remember I went to Sacramento for a lobbying session. I had been thinking of taking some time off work—like a year off break—and Dave mentioned something to the effect of, “You could do this—you’re good at it,” and apparently that was all the motivation I needed. Locally some of my friends were saying we need to have a stronger voice here, that we’re seen as a joke. People are dying. We had a pretty deadly year in 2012. Almost every month somebody was getting killed. There was really no outcry. There was outcry, but it wasn’t taken seriously at City Hall. A lot of the deaths were clearly from road design flaws. Good design could have saved their lives. The biggest problem was usually drivers going way too fast. The speed differential was way too high. At this point both Thom and Will had left San Diego. Then I was just sort of stuck with the BikeSD blog. It was starting to take over more of my life. I was starting to attend way more meetings. I was genuinely enjoying the work, finding it invigorating. In 2012 or so, an attorney I met through these social riding groups suggested that I formalize what I was doing on a volunteer basis and said he’d help with the incorporation work and in filing all the necessary paperwork. Another friend, also a rider, offered to pitch in in helping figure out how we’d communicate appropriately. Everyone came together to help me in various these ways to formalize the blog as an organization—so it became BikeSD, a proper organization. How was BikeSD’s relationship with the Bike Coalition here? We’re all friends now for the most part. But back in 2011-12, the SDCBC had a reputation because their advocacy was dictated by vehicular cycling promoted by John Forrester. When people argue online about how vehicular cycling is somehow positive, they have no idea what it’s like to ride in San Diego and what reality local riders here are dealing with. It’s one thing to talk about taking the lane on a narrow street in Boston. It’s a completely different arena when you’re on 50-mile-an-hour road. You are going to get killed. There’s no two ways about it. If you’re going uphill with the sun in your face, no one can see you even if you’re in the middle of the road. I stumbled across John Forrester and his adherents by accident. I remember one particular incident. This gentleman was riding to work, and he got killed. Two cars drove into him. He was dead on the spot. The SDCBC would always say that they were not affiliated with this one forum, but it had their name on it. On this forum, boardmembers from the SDCBC essentially blamed the man for his own death, which I thought was a particular kind of cruelty that I find just unacceptable, in any universe. But the SDCBC never put out a statement saying that the death was a tragedy and that it was unavoidable. Something to show that they cared about their own constituents. I eventually got on the SDCBC board and took on the position of a vice chair. And I actively contributed toward the organization’s strategic planning process. At the time, I had the mindset that you could change from within. So even if the SDCBC didn’t advocate for infrastructure, maybe, from within, I thought I could help create a paradigm where we would do that. The board was composed of about 33 people. I was one of three women, and the only non-white person. Around this time, I took my first trip to Europe. We went to Denmark for a week. Before then, I hadn’t necessarily been opposed to protected bike infrastructure, but I didn’t really get the impact of it. I didn’t really understand it. What blew me away was how subtle it was. I was envisioning these gigantic engineering feats. I didn’t envision it being a slight change from more-or-less a sidewalk, or a slight change from the actual road. It was so subtle and it was so small of a change but it had such amazing impacts. The entire city culture is different. That blew my mind. We rode through the countryside and the cities. We had a lot of environments we were riding through that gave me a good sense of how the infrastructure and the design itself had completely changed. Prior to going to Denmark I just wanted a stripe of paint. My expectations were so low. That was about all I could imagine. I can ride vehicularly with the best of them. I have zero problems riding on any street in the city. I have no fear. On the other hand, am I going to take a six-year-old with me? No. There’s no way I will do that. It’s cruel to expect somebody of a lesser ability than you, to do that sort of riding. I was advocating for infrastructure. We had some infrastructure supporters within the coalition, but they were just so beaten down from years of being shown bad examples of how that never works. I strongly believe in the power of politics – in having your elected representative being your voice, because they control public money. There’s no reason they should not be listening and actually doing the will of their constituents. At the time I was really pushing hard for SDCBC to get involved in the mayor’s race. They were very nervous about it. They said “we’re a c3 [educational nonprofit] organization – we can’t.” I responded that we don’t need to endorse, but just to get the candidates on the record. They honestly just laughed at me. Eventually one of the candidates agreed to meet with BikeSD people, our readers. We wound up having a little coffee shop meeting. He came out with an actual bike plan: creating a CicLAvia open streets event happening regularly, stuff for infrastructure, how much money would go toward it. It was actually pretty amazing. That had never been done in San Diego’s political history ever. They’ve never considered bicycling as a serious endeavor. Ever. Even though at the time we had councilmembers who rode to work, to City Hall. We had some legitimate people in power who did ride for both transportation and recreation, but they never used that in any way to leverage anything that I could tell, anyway. Around this time, too, I wound up getting access to San Diego’s bike history through Clifford Graves, the founder of Hosteling International here. He used to promote biking as a thing that the youth should commit to. He was a surgeon, so he saw the health benefits of it. He had documented every single thing ever about bicycling – from the 1800s all the way through the 1990s or so. There were these three or four gigantic scrapbooks I wound up borrowing, so I got a good history of how bicycling has been perceived. So I got a good sense of the history of bicycling because of those scrapbooks. That gives me complete authority to say that, until 2012, no one had ever ever addressed bicycling politically. Then all the other candidates noticed that the guy was getting good press, so they came out with their bike plans. At the time we had a guy who was a Tea Party supporter. He came out with a bike plan. It was not the best, but I can say that we did that. I was doing this as a blog: a random lady, running a blog, getting mayoral candidates to send me stuff. 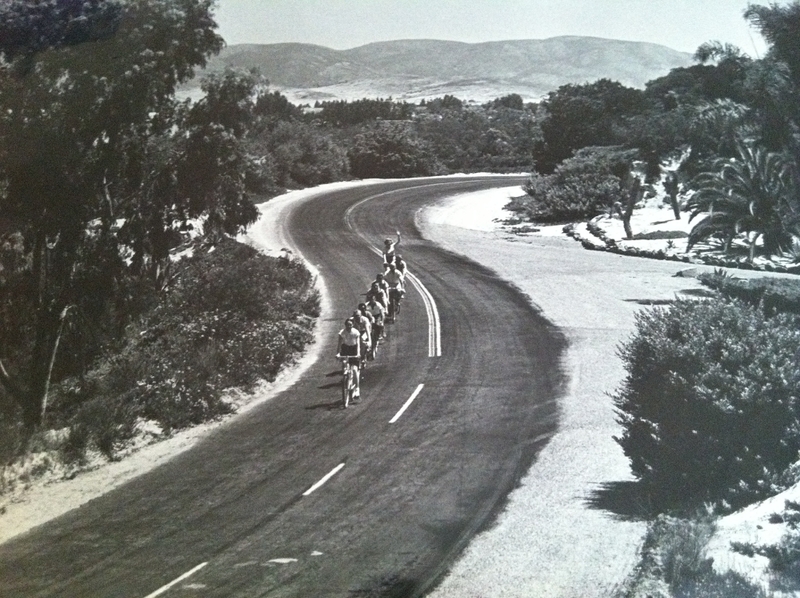 Similarly, there were all these early L.A. bike blogs. Online was still somewhat new and politicians were listening to it. I think bicyclists were wired by it, too. Suddenly we knew what was going on in city council meetings. It’s a huge tool that I think regressive forces haven’t been as nimble as progressive forces in using. Aaron Naparstek talked about the power of using these tools to advance a cause that doesn’t get any sort of mainstream airplay. Though it does to some degree now. Not all that much, at least in L.A. We cover stuff at Streetsblog, then it gets picked up three weeks later or something. That happened a lot with us too. Sometimes I get nervous when I write things because this is my interpretation. But then some reporter will pick up the exact story and run with it, using almost the same language that I’ve written. I know it’s my words. Then a councilmember is quoting it. That strikes a whole level of unreality that I still haven’t gotten used to. I would hope that the press would have the bandwidth to go research my interpretations. I mean sometimes I’ve tweeted things and they’ve literally taken my tweets seriously. Sometimes I’m just reading boring documents because I have insomnia. At three in the morning I’m reading things and tweeting it out, being extremely critical. That SANDAG [the Metropolitan Planning Organization San Diego Association of Governments] staff is apparently being paid to read my tweets is a whole new level of bizarre to me. Going back to how BikeSD became a proper organization. We had a launch party. We essentially borrowed everything straight out of the San Francisco Bike Coalition. We incorporated as a c4 – member-based [nonprofit] organization, straight-up advocacy. Almost everything I took straight out of SFBC. I went through all their annual reports, read everything. Just did exactly what they did. They’re the best. No need to reinvent the wheel. Talk about the lay of the land in San Diego. People think “It’s California. It’s a beach city, everybody rides a bike here. It’s easy.” Right? I’ll talk about the actual land, itself. There is San Diego County, then there is the city of San Diego, which is the largest city in the county. I have very little interest in the county, really. In the county, we have a lot of very rural areas. The city of San Diego is where all our focus is. The city is roughly the size of New York City, about 300 square miles. It’s a very neighborhood-heavy city; each neighborhood is very unique. There are a couple of very different things about San Diego that make it very unique. We have a lot of natural urban canyons that crisscross the entire city. That serves as a very natural boundary for a lot of the neighborhoods. Getting across the city, you usually have to cross many canyons. If you’re driving, the freeway cuts through so you don’t necessarily notice it. We’ve got mountains. We’ve got lakes. We’ve got rivers and, obviously, the ocean. So you’ve got a lot of these natural formations—in the city itself—that separate the neighborhoods, and that give each neighborhood a very unique feel. Every neighborhood is geographically, architecturally—whatever metric you want to use—completely different from the other. We’re currently sitting in the urban core of San Diego. It’s one of the older parts of the city, so we do have somewhat of a grid structure. It’s identifiable by most urbanists as being a city structure. If you go slightly north to where the newer neighborhoods are, they’re much more suburban. There are a lot more cul-de-sacs. There’s one or two major cross-thoroughfares, and that’s the only way you can get around. There’s no way to link the little neighborhoods together from within the neighborhoods—except going through the major thoroughfares. How do people get around here? The vast majority is obviously driving. Single-use car trips. We have a pretty substantial walking mode share, but that’s largely downtown. Downtown is very much a proper grid structure. It’s very flat, and there’s a lot of people who live and work downtown. What’s the bicycling culture like? Is there a lot of recreational riding? A lot of transportation riding? A lot of low-income riders? We have all of the above. Recreational, obviously, is pretty big here. A lot of athletes come into town to train competitively. Along the coast there’s a lot of really great riding to do, both for recreational purposes and otherwise. Anecdotally from my observations, transportation riding has grown since we’ve launched as an organization. But we’re still barely getting one percent, as far as bike-to-work. You definitely see a lot of low-income people riding. If you go downtown, you’ll see our homeless population all have bikes. San Diego cycling cuts across all three. I would say the most visible is weekend competitive recreational riding. Are there pockets of transportation ridership? Downtown or elsewhere? Yes. SANDAG, our MPO, has put automated counters all around the region. Downtown you definitely see cycling, but I would say you see the most along the coast. Parking is a big problem at UCSD. 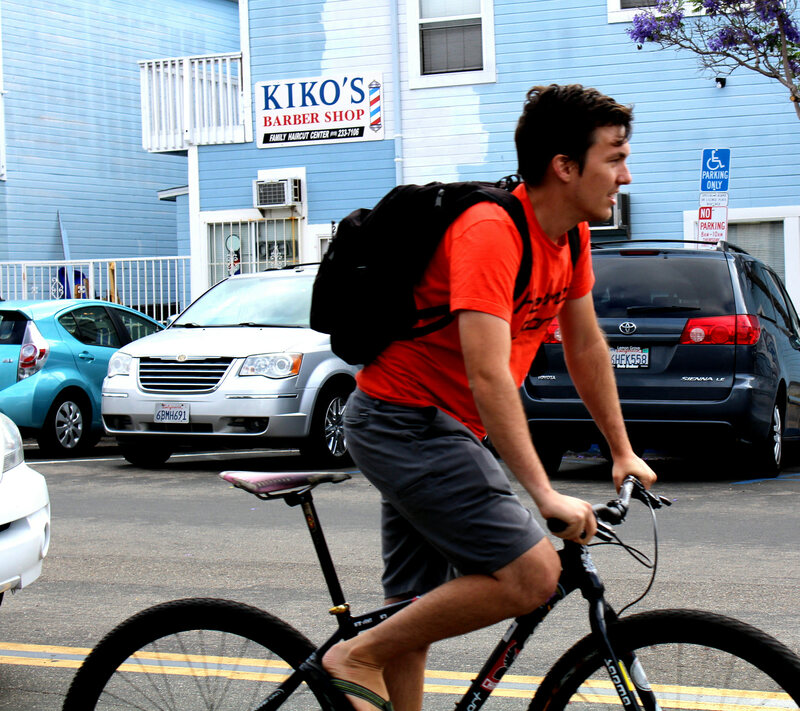 You see a lot of students who ride to UCSD as well as on SDSU campuses. Around the urban core you see more commuters going to work. At Broadway, you see a lot of office workers riding into town. It depends on which part of the city you’re in. We have huge challenges with the terrain. Even in the beach communities you’ve got a couple of pretty significant hills. I would say they’re more significant than even San Francisco—steeper. That’s a huge barrier that keeps people from riding regularly. What are your advocacy priorities this year, and in the coming years? Last year, the City Council adopted the Downtown Mobility Plan. Almost all of downtown is going to get a complete network of bike infrastructure—a combination of protected bike lanes, road diets, greenways, and pedestrian improvements. It’s a very amazing plan. Construction is going to start this year. Our current advocacy is trying to get the mayor to commit to the funding to build the network. There’s funding available; he just needs to commit to it. Are they looking to build it whole cloth? Or just pilot projects? Yes—whole. They used Calgary as an example of doing it. The end of this year, downtown should look very different. There are different phases; they’re going to start doing the road diets right away, because that’s pretty easy to do. Our current advocacy effort is within the city’s budget process and we are advocating for the mayor to commit to funding. The city adopted a Climate Action Plan about a year and a half ago. One of the goals of the climate action plan is to have six percent bike mode share by 2020. Our advocacy also includes getting the the mayor to commit to six percent of funding to go towards bicycling. We’re also asking all the councilmembers whose districts would be affected by the Climate Action Plan to commit to the ask. Finally, we also have a Vision Zero commitment from City Council and our Mayor which aims to reduce traffic fatalities to zero by 2025. Is six percent a heavy lift? It’s a very heavy lift, because we are barely touching one percent at this point. Most of the ask is not really for infrastructure as much as staffing. I know from talking to staffers they tend to be very overwhelmed. The current process of implementing bike infrastructure is following city resurfacing. They’re looking at the bike plans, then implementing whatever is there to be in alignment with the plans. Implementation during resurfacing is pretty good, but it’s also painfully slow and somewhat haphazard. To its credit, the city has done really good work in terms of making sure the balls aren’t getting dropped. They’re coordinating better, talking to the gas and electric company to not do undergrounding after the resurfacing work is done, for example. Our local engineers also are really good about enhancing what’s called for in the bike plans. For example, if our bike plan calls for just a traditional stripe, they’re looking to see if they can add a painted buffer to it. They’ve been doing that without us even asking for it, making us kind of irrelevant in a way that I really enjoy. We have a city Bike Advisory Committee that the city staff and the SDPD give updates to on a monthly basis as to what’s happening around the city. 2017 just got underway. A lot of the political focus is on the Trump administration and the horrors that that’s going to mean for a lot of communities on a lot of levels. What will be the levers that you use in 2017 to move bicycling forward? How do you plan to get stuff done? Well, our mayor Kevin Faulconer is Republican. He’s the only Republican mayor in any major U.S. city, to my knowledge. He has disavowed Trump’s rhetoric. He had a State of the City address last Thursday where he explicitly talked about how we’re a bi-national region; we’re all about breaking down walls. Our local business community does a lot of partnerships with the business community in the Tijuana Baja region. They really try to elevate that dialogue a lot. Faulconer also talks about how he is investing public funds in historically underserved communities, not necessarily in regards to bicycling. In our mayoral questionnaire, when he ran for reelection, he explicitly laid out how he wanted to support and invest in lower-income communities and support individuals who did not have access to vehicles. For a Republican Mayor in California, he’s definitely done a really good job of distancing himself from Trump’s rhetoric, some of that hateful element of it. I live in City Heights, which is a very low-income neighborhood as well, extremely diverse. It’s a very immigrant-heavy neighborhood, one of the densest neighborhoods in the city. He’s done a good job ensuring that the public services, libraries and so forth, are funded there. We have park access. A lot of resurfacing has happened there. Streets in City Heights are fairly well-maintained right now. In San Francisco and in L.A. there is quite a bit of bike advocacy discussion about equity. In L.A., lately, there is dialogue around gentrification and who are bike facilities for? Who do bike facilities serve? How does the equity dialogue play out in San Diego? BikeSD works a lot with other community advocates working on similar or complementary missions. A lot of them do work in under-served communities or historically under-served communities. They’ve done a very good job of highlighting deficiencies. City Hall has been cognizant and responsive to that, especially when compared with the past. 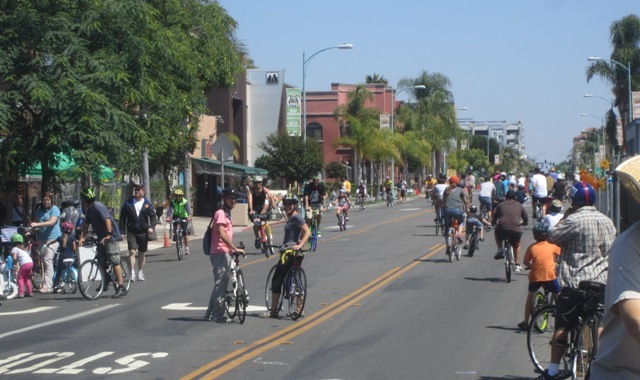 We had our last open streets event, which we call CicloSDias, actually in this neighborhood. It went through a lot of the underserved communities and also a gentrifying neighborhood. It connected all the different communities together. I’ve been a little bit more aware of equity. I suppose my background also comes into play here. I try to make sure that I’m not forgetting my own people, so to speak. If you had a magic wand and you could change one thing about San Diego transportation overnight, what would it be? I think open streets are the best advertising for what it is we’re trying to work toward. Regular events that highlight streets without cars—I think it really opens up minds. To me, the biggest noticeable effect is how quiet the neighborhood gets without the din of the constant cars driving around. I don’t think any stat, any visual, compares to experiencing an open streets event. They’re truly transformative. We could have them very regularly—either on a weekly or monthly basis. Either have parallel events in all the neighborhoods, or move them around. Businesses love it. Residents love it. Everyone loves it. For a couple of hours on a weekend, it’s really a minor inconvenience. What’s the status of CicloSDias? How often does it happen? We’ve had four so far. The first was in 2013. It’s been somewhat inconsistent. One thing we’re advocating for is to make it a regular event every quarter, so that it becomes a regular part of the city function. The city’s economic development side sees benefits of CicloSDias. They have funding for CicloSDias. It’s moving, but it’s moving at the San Diego pace. I’m pretty hopeful. We have a lot of support among the councilmembers. Right now it’s just a coalition of different organizations that put it together. There’s no entity that puts it on. So we’re trying to make it more formalized. It’s been tricky for different cities. From 2010 to 2012 I worked for CicLAvia, the L.A. nonprofit. Nonprofits can’t pull it off by themselves. If it’s just the city doing it, it’s harder to get sponsors, grants. I think real coalition-building is necessary to make ciclovías strong, effective, and frequent. The last one that happened was by far the most successful on multiple levels. Both in terms of attendance, and overall happiness with how it went. I think a large part of that was we had the nonprofits coordinating with business districts in each neighborhood. The business districts provided in-kind support. They did outreach to businesses, helped in promoting it. The city obviously was on board with it. Our police chief is actually a cyclist herself. So we have all these little pieces in place. The biggest disadvantage, as I see it, is that we don’t have a very mature activist community. A lot of this culture change is almost alien. If you ask your average San Diegan they will say, “Oh yeah—I love biking. I want to bike all the time.” But I don’t think they understand that connection. Because L.A. and San Francisco have a very mature activist history, a lot of things are somewhat easier. That push from advocacy is not seen as weird. Here it’s seen as odd to go in and demand things from City Hall. The business community has had a very strong influence on how stuff gets done in San Diego—for decades. So there is a tradition of business activism – but not others. Exactly. So that’s the difference here. Of course. This was fun. For more on Sam Ollinger, go to BikeSD. • Kudos to Sam for her vision and persistence — in the lion’s den! Bike East Bay's Executive Director, René Rivera, will step down on May 1. The organization's communications director, Ginger Jui, will take over as interim ED, pending a search for a new full-time exec.